Krone has unique expertise in the field of level measurement technology, with capabilities not only in standard applications, but also in applications which are considered challenging and which require tailor-made solutions. Level devices include non-contact level (radar and ultrasonic), contact level (TDR guided radar), level switches and other level technologies. Radar devices based on the TDR principle, using guided electromagnetic pulses.High accuracy and reliability, even in difficult applications, and by a unique,innovative operating philosophy. 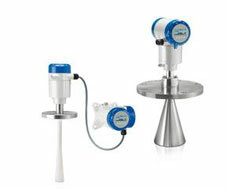 KPSI / Measurement Specialties / T.E. WIKA has a comprehensive range of level measuring instruments available for temperatures up to 450°C, densities from 400 kg/m³ and pressure ranges up to 500 bar. The product spectrum includes bypass level indicators, sight glass level indicators, magnetic float switches and optoelectronic switches. Customer-specific designs complete the WIKA offering.